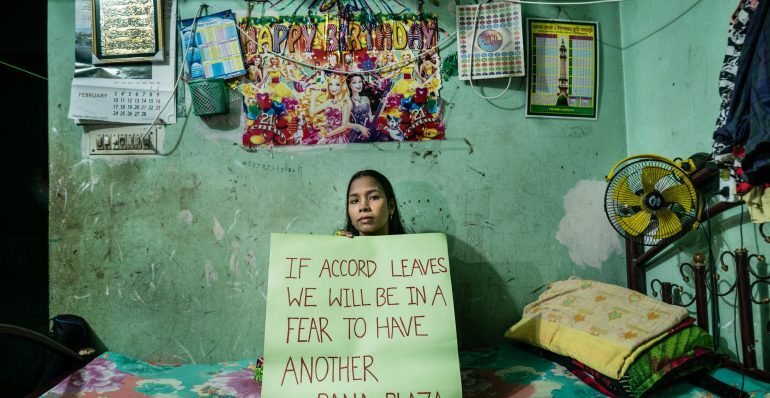 In the almost six years since the Rana Plaza collapse, the Bangladesh Accord has brought great progress to the safety situation of garment factories in Bangladesh. On 7 April however its Bangladesh office might be forced to close down because of a restraining order. Labour Behind the Label believes that it is vital for the safety of workers that the Accord can continue as it used to in Bangladesh. We urge the government of Bangladesh to support the Bangladesh Accord’s appeal against the restraining order. This is happening in the wake of the worst repression in a decade against workers who protested for higher wages. Workers in Bangladesh deserve safe factories, living wages and freedom from repression. Since the accord started its vital work, 1600 factories have been inspected and are undergoing safety remediation. 89% of the original safety hazards identified like bars on windows or locks on fire escapes have been fixed. 1000+ safety committees are being trained. 97% of lockable gates have been removed. Yet there is still a lot more to do. The remaining problems that need to be fixed are structural and systematic, and arguably are the expensive and difficult ones to implement. This is why the Accord must continue. Many worker representatives, brands and other stakeholders have spoken out in support of continued operation of the Accord from Bangladesh. What is the Bangladesh Accord? 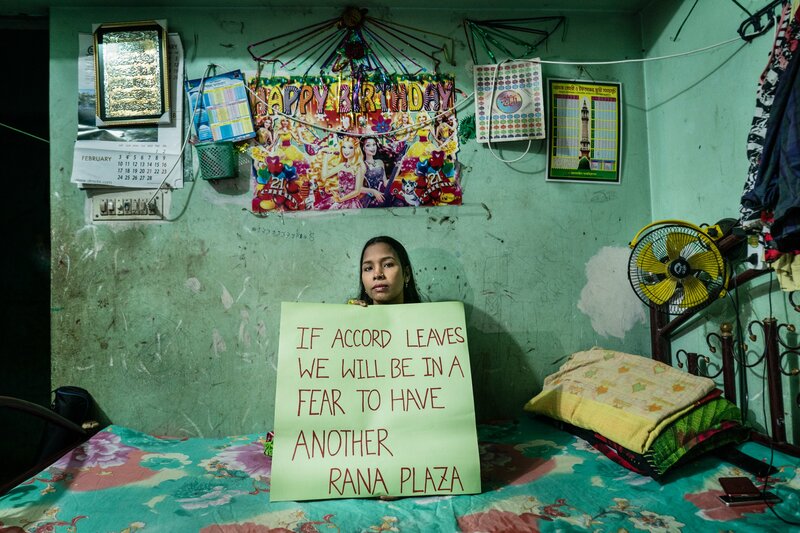 When in April 2013 the Rana Plaza building collapsed, killing at least 1,134 garment workers, this was the final incentive to start addressing the notoriously unsafe situation of many garment factories in Bangladesh. Within a few weeks, the Bangladesh Accord on Fire and Building Safety was established and started inspecting factories and monitoring repairs and improvements. It was much more successful than earlier attempts to improve the safety of factories in Bangladesh because it welcomed workers’ participation and was legally binding for all brands that signed on. After the initial five years that the Accord was established for a large majority of the safety issues detected were solved, but because the work was not yet done. Therefore the brands and trade unions created a Transition Accord, which would work for another three years to give the government of Bangladesh time to build up its own institutions to carry out the inspection work. Over 190 international brands are members of this programme. Why might its Bangladesh office be forced to close? Before the Transition Accord was due to start in June 2018, the Bangladesh High Court put a restraining order on the Accord’s inspection programme. This meant that the Accord would have to leave the country after 30 May 2018. At the request of the Bangladesh government, the High Court postponed the date to 30 November and declared that the domestic inspection agency – the Remediation and Coordination Cell – would need to be ready at that same time to take over. The Accord office has filed an appeal to lift the restraining order. The Supreme Court decision on this appeal was postponed six times since 30 November and is now due on 18 February 2019. Would a negative decision mean that the Bangladesh Accord must stop its work? No, the Bangladesh Accord has a headquarters in Amsterdam and will be able to continue work from there. The brands that signed the Accord are still legally bound to the contract they signed with the Global Union Federations. The contract stipulates that brands cannot withdraw from the contract unless they fulfilled all their obligations. It will however be more difficult to inspect and monitor factories if the inspection programme is not in Bangladesh itself and inspectors might have to come from abroad. The Accord will not be able to inspect as often and thoroughly as it used to. As it is unacceptable to suggestfactories are safe while they cannot be checked properly, the Accord will have no choice but to be more strict towards factories. This means that factories that are now on notice for not carrying out their life-saving renovations fast enough will after a closing of the Accord’s Bangladesh office be categorized as unsafe to produce in, which, according to media reports, means that in the next two months more than 500 factories will be judged unfit for Accord brands to buy from. What can brands do to prevent this? Brands have a lot of power in Bangladesh. Around 80% of the country’s export revenue comes from the garment industry. Among the Accord members there are some of the biggest garment brands in the world and the largest buyers from Bangladesh. If these brands let their Bangladeshi suppliers and the government of Bangladesh know that they can only produce in factories that they know are safe and that at this moment the Accord is the only institution that has the capacity to carry out a credible safety programme, their voices are must have effect. Brands should therefore make their orders contractually conditional on the continuation of effective monitoring by the Accord. The Accord has filed an appeal against the restraining order. International labour organizations and trade union federations are requesting the government of Bangladesh to support this appeal. How will the Transition Accord hand over its tasks to a national regulatory body? The signatories to the Transition Accord are committed to hand over the inspection and remediation work of the Accord to a credible and demonstrably functioning national regulatory body. The ILO oversees the indicators for the functioning of such a body and can assess whether the readiness criteria have been reached. These indicators include full transparency, proven inspection capacity and fully operational enforcement mechanisms. For other work of the Transition Accord, notably the complaints and safety training functions, a transition plan has been developed and presented to the government. Are the government of Bangladesh and its national inspectorates currently ready to take over the inspection work? A September 2018 report by the Bangladesh Compact – a cooperation between Bangladesh, the European Union, the United States, Canada, Bangladesh and the International Labour Organization in order to improve conditions in the garment industry – draws a range of conclusions on the national institutions now in charge of inspecting factories in Bangladesh: Department of Inspection for Factories and Establishments (DIFE) and the Remediation and Coordination Cell (RCC). The observation that DIFE has insufficiently followed up on its commitment to make its inspection and remediation process transparent and reports publicly available. While it has published inspection reports, the information regarding remediation is outdated and incomplete (p. 22). The observation that the RCC has worked on an escalation protocol to take effect if factories do not cooperate to inspection or remediation, but that this protocol has not yet been enforced (p. 26). Recent newpaper articles also have raised doubts about the political will in the Bangladesh government and its inspection institutions to fully enforce remediation measures. The observation that of the 300 Corrective Action Plans that DIFE received on the basis of the initial inspections almost all contained mistakes and only five were approved. Despite the absence of credible Corrective Action Plans, DIFE nevertheless reports a remediation percentage of 29% (against a remediation rate of 89% for the Accord). Whether this is based on approved or credible action plans cannot be checked because the DIFE public database is not up to date (p. 29). Transparency and enforcement are two of the indicators according to which the ILO keeps track of the DIFE/RCC readiness to take over inspection work from the Accord. How was this restraining order put in place? One of the Bangladeshi factory owners who failed to properly inform the Accord and carry through the renovations needed to make his factory safe sued the Accord for being removed from the list of factories that Accord brands are allowed to source from. In an extraordinary unilateral action, the Bangladesh High Court used this court case to issue a Suo Moto restraining order against Accord office operations in Bangladesh, effective May 31, 2018. The restraining order was later modified and temporarily lifted, based on a submission to the High Court by the Government of Bangladesh that the Accord be allowed to operate until 30 November 2018. The order was postponed with the hearing six times since.